If you read my article 5 Coffee News Stories That I Never Want To Read About Ever Again, you already know that I am tired of hearing about the health benefits of coffee. My main complaint is that we all respond differently to coffee and that our response to coffee can change as we get older. What is observed with a majority of people in a health study may have no relevance to you as an individual. The only data that matters is your own. For the past two years, I have tracked the number of coffees I have consumed daily and a sleep quality score. 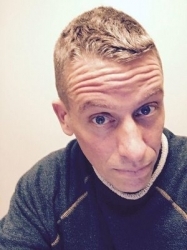 I outlined this project in the article The Quantified Coffee Drinker. But I wanted more data. I wanted to learn if I was genetically predisposed to certain chronic illnesses. 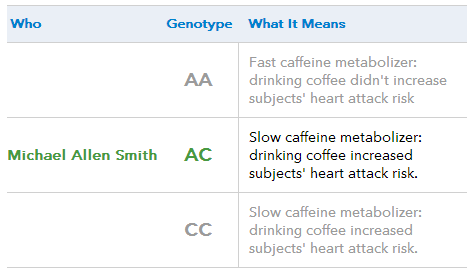 I also wanted to learn more about how my body metabolizes caffeine and if I could determine how healthy coffee was for me based on my genetics. So I ordered a genetic test from 23andMe. Years ago this would have cost thousands of dollars and taken months to analyze. Today you get a test for $99 plus shipping and have your results in about 8 weeks. Do the Healthy Benefits of Coffee Apply to You? According to a WebMD article Health Benefits of Coffee by Jonathan L Gelfand, MD, the most common conditions that coffee has been reported to help with are Type 2 Diabetes, Heart Disease, Parkinson’s and Alzheimer’s. Instead of jumping into the strengths or weaknesses of the studies used, I’d like to propose an alternate way for coffee drinkers to assess how much coffee helps or doesn’t help them in the prevention of these serious health problems. If a coffee drinker had an elevated risk for an outcome that could be helped by coffee, then continuing to drink coffee or even drinking more might be a wise path. However, if a coffee drinker is not genetically predisposed to an illness that coffee consumption is to provide benefit, then assuming coffee yields an additional protective shield may be a false assumption. And lastly, if one’s genes signaled issues with coffee consumption then a reduction or elimination of coffee might produce the best health outcome. The vast amount of data 23andMe collects is amazing. For this article, I’m just going to focus on the data related to coffee. For a more detailed review of the service, check out my personal blog post 23andMe Results. What I wanted to know is if I was a risk for any of the chronic illnesses that coffee has been reported to help lower risk. Here is my data. My genetic data shows me that I am not at an increased risk for the ailments that coffee is reported to show benefits for. Now will drinking coffee lower my risk even more? We don’t know. The health studies I’ve read do not break this information down. My interpretation of this information is that since my risk level is not elevated for these 4 conditions, the need to consume coffee to lower my risk factor would have far less benefit than someone genetically predisposed. Caffeine is primarily metabolized by the liver enzyme cytochrome P450 1A2 (CYP1A2). The form of the SNP rs762551 a person has determines how fast CYP1A2 metabolizes caffeine. In this study, people with the slower version of the CYP1A2 enzyme who also drank at least two to three cups of coffee per day had a significantly increased risk of a non-fatal heart attack. The study found that fast metabolizers, on the other hand, may have actually reduced their heart attack risk by drinking coffee. Am I a fast or slow metabolizer of caffeine? I am a slow metabolizer of caffeine. As a slow metabolizer of caffeine, my risk of heart attack is significantly greater when drinking two or more cups a coffee per day. That isn’t good. Is Coffee Healthy For Me? What this test told me is that I shouldn’t be overly worried about the ailments that coffee is supposedly protective against, because my risk factor is either already decreased or typical of the average population. It also told me how my body processes caffeine might make two or more cups of coffee bad for me. The sweet spot for my coffee intake might be 1 cup a day. I hope the next time someone shares a link with you how wonderfully healthy coffee is that you remember this article. It can be healthy for some and bad news for others. We are all different. The only data that matters is our own. Since getting my results, I have gradually reduced my consumption to 2 cups a coffee a day. In addition to having my genetic test, I have also been tracking my coffee intake and sleep quality for over two years now. I have found when my coffee levels are too high (3 or more cups a day) for a few weeks, I start to feel worse. If you are a health conscious coffee drinker and are interested in dialing in the optimal amount of coffee, I highly recommend getting the 23andMe test. 23andMe Results – Personal blog post reviewing my results of the 23andMe test.